Last night, City of DeKalb held a public hearing and approved an annual budget for the Community Development Block Grant (CDBG). CDBD is a federal program administered by HUD that helps ensure viable communities, particularly in the area of decent and affordable housing for low- to moderate-income residents. The general public did not participate in the public hearing. We rarely do. The CDBG budget is treated as routine and unremarkable, even when it’s not. I’m still digesting the DeKalb city council’s goal-setting session from earlier this week. The alderman from the Fifth Ward, Kate Noreiko, was pushing to build a new DeKalb Municipal Building instead of renovating the one we have. She says she thinks it’s unsafe, though she provided no foundation for this belief. Part of Noreiko’s argument was that, if the pipes there freeze and burst, what would city workers do? Hold that thought for a moment. I want to introduce another goal council members talked about evening, which was emergency operations planning. During that discussion, Noreiko wanted to address active shooter situations. My mind went back to frozen pipes, because we don’t have SWAT teams for that. Does a drive around DeKalb feel like you’re continually crossing rough train tracks even where there aren’t any? Guess why. 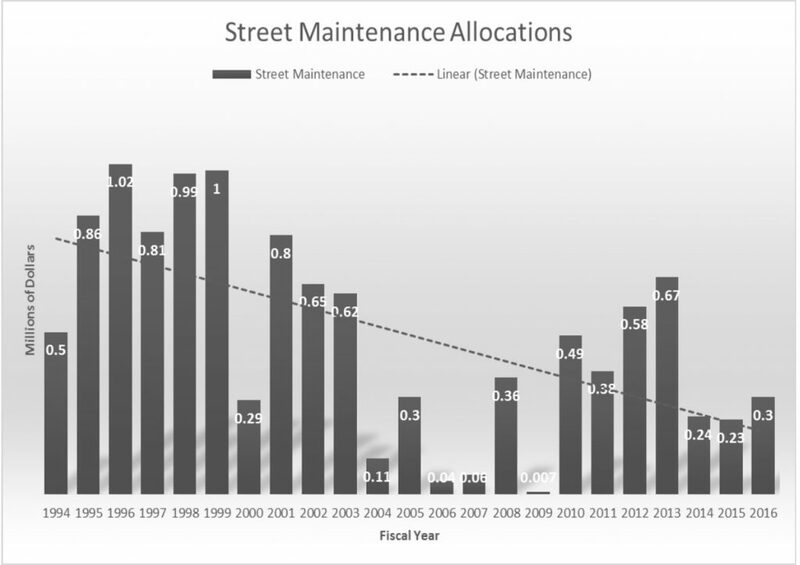 The above are actual expenditures for street maintenance. Shown are total expenditures from two primary sources for maintenance, the motor fuel tax (MFT) revenues that are shared with us by the state on a per capita basis, and local (aka “home rule”) fuel taxes. From the chart above, it looks like MFT revenues are failing — as if we’re in recession again now. While these revenues are somewhat stagnant, the much larger problem is that the city has gotten into the habit of spending these funds on other stuff. Mulling over our current the lack of funding of capital projects and fleet needs, I ended up deciding to contrast the spending from three different time periods, as expressed by transfers (or in the case of 2018, expected transfers) out of the General Fund into the Capital Projects and Fleet funds. I’ve also placed rough estimates of average numbers of employees using full-time equivalents (FTEs). Clearly, we’ve been here before — riding the edge of the cliff, I mean. The Chronicle has published a letter to the editor that caught my eye. It’s about local candidates and their positions on the issues. The words that they use may change, but the rhetoric is the same. The writer goes on to list the same old, same old: DeKalb-NIU relations, easing of the tax burden, and jobs/business climate. He wants to hear specific ideas. While I largely agree that some city candidates are hard to pin down, I believe the real issues in DeKalb are more fundamental, and require remediation before we can progress. The following is a production of StrongTowns.org. Note: Strong Towns is not responsible for any mental duress resulting from repeated watching of this video. We are also not responsible for angry reactions from planners and engineers confronted with the illogic of their world view. If watching as part of a group, we recommend having a padded room or some type of physical restraint system available to keep those that develop a temporary feeling of hopelessness from doing damage to themselves or others. As DeKalb tries to figure out how to come up with $6 million a year more to repair our neglected streets without chasing out more of our population, there are ways to put together better answers. For our city, it means a major shift away from its Edifice Complex (public spending on buildings that don’t contribute to the tax base) and development of a grownup’s appreciation for basic infrastructure.